Never mind waiting for its scheduled debut in September at the Frankfurt auto show; Infiniti has pulled the wraps off the production version of its new Q30 compact hatch. The Q30 is intended especially for Europe, where Infiniti hopes it and its upcoming crossover sibling, the QX30, will ignite sales next year. The Q30 and QX30 are being pitched at the hot core of the European premium auto market: rising demand for small, sporty vehicles with cargo space or cargo utility. An IHS Automotive forecast predicts that demand for small SUVs and crossovers will double in Europe’s key markets over the next four years. The British-built Q30 goes on sale in Europe at year end, giving Infiniti a shot at a segment dominated there by the likes of the Audi A3 and BMW 1 series. U.S. retailers are also hot for the new model, which will arrive here next spring. Infiniti is weathering a new-product drought in the U.S. this year as it waits for the European-made compacts. The QX30 crossover arrives in U.S. showrooms next summer after it has filled inventories at Infiniti’s European dealers. 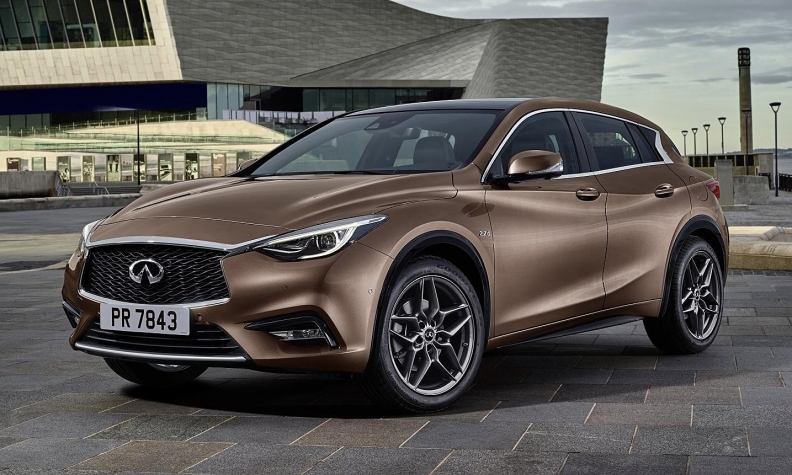 The version of the Q30 revealed Tuesday shows a four-door hatchback of mixed ancestry -- one part sporty coupe, one part crossover and one part luxury sedan. It is built off Mercedes-Benz’s MFA architecture as part of a growing global vehicle-development partnership between Daimler and the Renault-Nissan Alliance. But the design is clearly Infiniti. The car features Infiniti’s new styling ethos -- swept-back side panels and large narrow headlights, with a more prominent grille. The production version of the Q30 is only modestly altered from the concept versions that have been shown at various recent world auto shows.